Auckland, 18th August 2016 — The 17th annual AmCham DHL Express Success & Innovation Awards were held at the Pullman Auckland Hotel last night, with Douglas Pharmaceuticals winning the Supreme Award for trade with the United States. Award judging panel member, Alex Broughton said “Douglas demonstrates a very high standard of business strategy, operation and performance. The establishment of Douglas Pharmaceuticals America in 2003 to sell generics into the US pharmaceutical market has delivered standout growth with Douglas Pharmaceuticals on track to grow their global sales to $244m by 2020. The Judges also noted that Douglas Pharmaceuticals are committed to continuous Innovative R&D investment”. The AmCham DHL Express Success & Innovation Awards celebrate success and innovation in the export, import and investment sectors between New Zealand and its third-largest trading partner, the USA. Winners of the importer, exporter and the Eric & Kathy Hertz award categories receive 100,000 airline miles from Hawaiian Airlines. In addition to AmCham, DHL-Express and Hawaiian Airlines, the Awards are also supported by 3M New Zealand, Baldwins, Fonterra, Prescient Marketing & Communications, The Pullman Auckland Hotel, media partner The Business, and wine sponsor Fine Wine Delivery Company. Other previous winners of the Supreme Award include Zespri International, Specialist Marine Interiors, Peace Software, Airways Corporation, HumanWare, Tenon, Zeacom, Pratt & Whitney Air New Zealand Services t/a Christchurch Engine Centre, Fonterra Co-operative Group, Buckley Systems, Vista Entertainment, Greenshell New Zealand, Orion Health and Fisher & Paykel Healthcare. 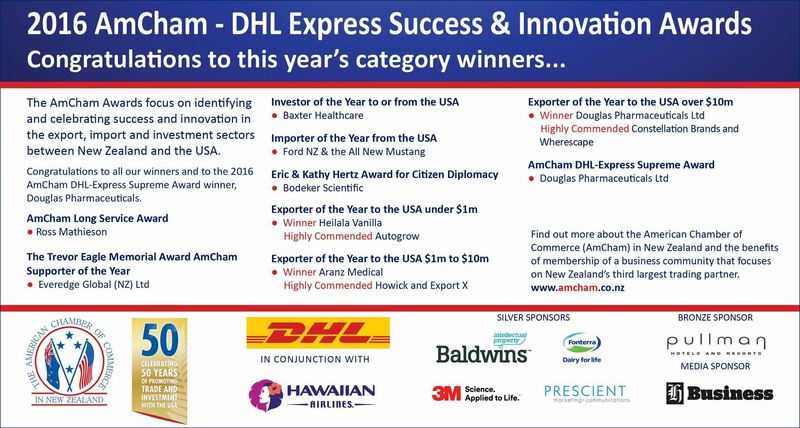 AUCKLAND, 18 July, 2016– The American Chamber of Commerce in New Zealand has today announced the finalists for the 2016 AmCham-DHL Express Success and Innovation Awards, held in conjunction with Hawaiian Airlines, the 17th year of these awards celebrating success and innovation for companies doing business with the USA. Mike Hearn, Executive Director for AmCham, says 2016 has seen another very strong group of entries, covering a diverse range of products and services. While technology companies are again to the forefront of finalists there are some strong entries from pharmaceuticals, wine, building products, cars, food & beverage and engineered products. “Exports to the USA increased for the 6th consecutive year and we are also seeing big growth in the services sector with the USA. The US accounts for 11.6% per cent of New Zealand’s total earnings from overseas trade.” says Mr Hearn. In addition to AmCham, DHL Express and Hawaiian Airlines, the awards are supported by 3M New Zealand, Baldwins, Fonterra Co-operative, Prescient Marketing & Communications, The Pullman Hotel and media sponsor The Business. Previous winners of the Supreme Award have included Zespri International, Peace Software, Airways Corporation, HumanWare, Tenon, Orion Health, Zeacom, SMI Group, Fonterra and Pratt & Whitney Air New Zealand Services t/a Christchurch Engine Centre, Buckley Systems, Greenshell New Zealand, Vista Entertainment and Fisher & Paykel Healthcare.